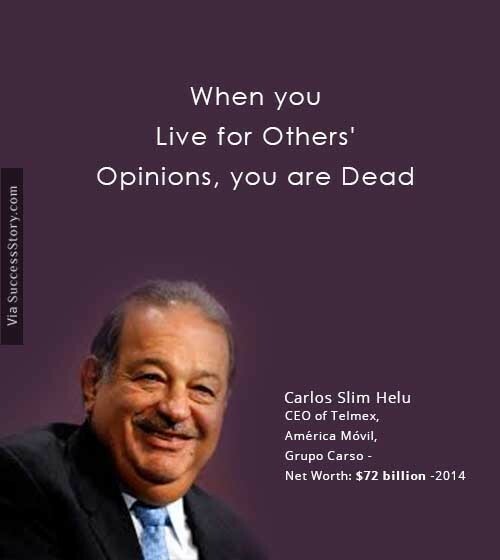 Carlos Slim Helú is a Mexican philanthropist, business magnate and investor with a Lebanese ancestory. Slim was ranked as the world’s richest person in the year 2007 and then once again from the years 2010 up until 2013. Slim is popularly and fondly known as the “Warren Buffet of Mexico”. This head strong and ingenious man has a profound impact on the lives of people. He strongly urges people to live for what they believe in without being bothered by other people’s opinions. "When you live for others' opinions, you are dead"